Yoga during pregnancy has a wealth of benefits for your mind and body. It can be an ideal way to stay in shape and prepare yourself for labor. Researchers have found that prenatal yoga reduce stress, improves sleep, and strengthens the body. Many pregnant women experience back pain and morning sickness. Yoga alleviates these symptoms while helping you shift into a more positive mind state. Relax your body - Numerous studies have shown that yoga helps pregnant women cope with pain. This form of exercise strengthens the muscles that take part in pushing the baby during labor. They also help bring back flexibility and comfort to bones in the front and back of your hips. As an added bonus, yoga improves posture, reduces back pain, and makes ligaments more elastic. Reduce anxiety - Scientists have found that yoga lowers blood pressure and slows hearth rate, which helps reduce anxiety and stress. It also improves sleep and decreases the risk of pregnancy-induced hypertension and preterm labor. 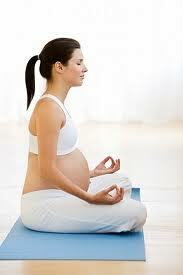 Yoga during pregnancy alleviates mood swings and helps you feel more relaxed. You will gain more self confidence and feel better about yourself. Reduce pain during childbirth - Practicing yoga is one of the safest and most effective ways to ease labor pain. Some breathing techniques and asanas focus on birth preparation. Your yoga teacher will show you how to strengthen your pelvic muscles and control pain. It is extremely important to perform yoga poses only under an expert's guidance during pregnancy. Improve your overall health - Researchers have found that yoga improves digestion and expels toxins from the body. It also improves blood circulation and reduces water retention. Yoga during pregnancy tones and strengthens muscles, including the pelvic floor. This form of exercise reduces the need for medication and helps you bond with your baby. You will feel more self confident and learn about the positive aspects of being pregnant. By attending yoga classes, you will meet other moms who understand what you're going through. Both the mother and her baby can benefit from yoga classes.